Jim Richards was saved & answered the call to preach at age 17. He pastored for 21 years in Louisiana, later serving as DOM in Bentonville, AR. He has preached over 150 revivals traveling & ministering in all 50 states & 16 countries. He has preached at seminary chapel services, pastors' conferences, state conventions & the annual meeting of the SBC. Dr. Richards has served the SBC on various committees & boards. Dr. Richards’ education includes two undergraduate degrees, an M.Div from New Orleans Baptist Theological Seminary & D.Min. from Mid-America Baptist Theological Seminary in Memphis. In June 2007, Dr. Richards was elected First VP of the SBC. 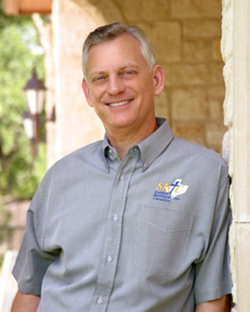 When the Southern Baptists of Texas Convention was formed in Nov of 1998, Dr. Richards became the first Executive Director. The SBTC has experienced phenomenal growth both numerically & financially. Dr. Richards& his wife, June, have three children & three grandchildren.